Get ready to roll in some of the most gorgeous countryside of Piedmont! We meet at the Tortona train station (about an hour south of Milan), then shuttle another hour to Gavi, a white-wine region in the southeast corner of Piedmont. After the bikes are fitted, we’ll do a 15-mile warm-up ride before lunch. This will be a loop around Gavi, the town from which Gavi di Gavi wine takes it name. Here the roads go up and down some wooded hills, past stretches of vineyard and farmland, through the river town of Arquata Scriva, and back to the hotel. Lunch will be at a nearby agriturismo that offers homemade cooking, a beautiful view, and peacocks roaming the grounds. In the afternoon, you have an option for more miles, or a tour and wine tasting at Villa Sparina, a leader in the Gavi area, which has turned its old farming structures into beautiful 4-star hotel; this will be our home base for the next two days. Over hill and dale, we cycle through Gavi’s picturesque countryside. Our morning ride takes us down a pastoral river valley, then up through the tiny hilltop villages of San Cristoforo, Castelleto d’Orba, and Montaldeo. Along the way, we’ll pass from the wine roads of Gavi into the terrain of Dolcetto d’ Ovada, a quaffable red table wine in a nearby DOC zone. Again, it’s wine country, so we’ll encounter a number of hills and make the mileage count! After our bike ride, we’ll shuttle by van to an afternoon wine tasting at La Guistiana, a Gavi winery situated in a stately 18th C. villa surrounded by statues and chestnut trees—one of many such properties built by nobles from Genoa as their countryside escapes. Here we’ll sample several single-vineyard Gavis that demonstrate how terroir affects the taste of the cortese grape. Today we move to Asti, famous for its Asti Spumante and Moscato d’Asti wine. We’ll shuttle part-way, downloading our bikes in the town of San Salvatore. From here, it’s a 30-mile point-to-point ride to the city of Asti. The route cuts across a swath of rolling terrain around Monferrato, another wine region where the Barbera grape was born. We’ll pass through ancient hilltop villages, where we can spy the Alps peeking out on the horizon, as well as farmed flatlands. Morning offers a loop ride that take us north of Asti, on gently rolling hills covered with vineyards that grow moscato, barbera, and grignolino, one of Piedmont’s many obscure but captivating farmhouse reds. 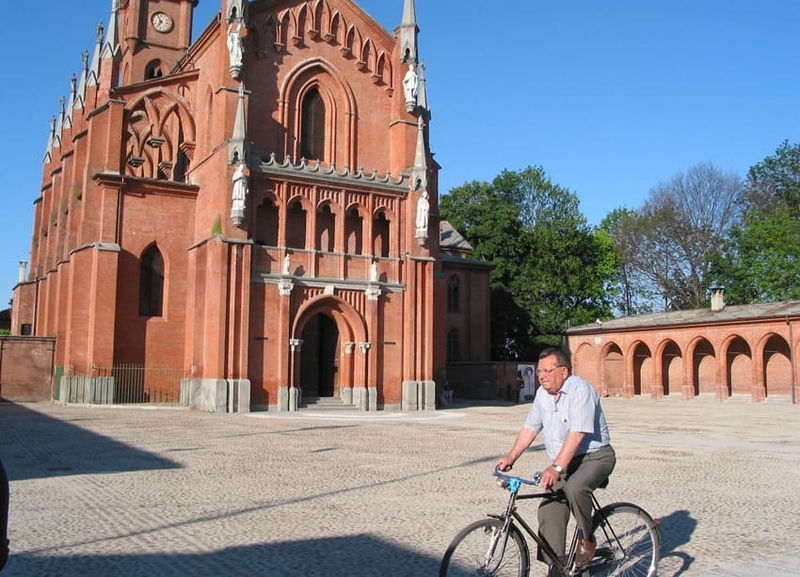 This ride passes through bucolic landscapes with long slopes capped by stone villages and country-baroque churches. Today we transfer from Asti to Alba by bike, riding along the ridge overlooking the Tanaro river valley. We’ll pass through quaint hilltowns every few miles and ogle at magnificent castles in Govone and Guarene, biking all the way to our hotel in Alba. After a well-earned lunch in town, we’ll shuttle to Barbaresco, a hilltop village just outside of Alba and sample Barbaresco wine, among Piedmont’s most regal reds. We’ll visit the highly regarded estate of Marchesi di Gresy. Here we’ll see how the sensitive nebbiolo grape responds to slight differences in soil, as we taste through their Barbareco cru. We’ll also try their charming dolcetto and their steely sauvignon blanc, a rare grape in Piedmont. In Piedmont, Mango is not a fruit, but a town. Our ride today loops through this wine zone for the moscato grape. We first climb to Grinzane Cavour, then continue upward to Diano d’Alba, the highest point in the various Dolcetto wine zones. From here, we bike on a long, lovely country road that follows the twisting contours of the hills, offering gorgeous vistas of dolcetto and moscato vineyards, hazelnut groves, and family farmsteads. We’ll stop in Mango for lunch. Then we can either loop back to the hotel by bike, catching a good number of descents. Or we can shuttle straight to Barolo for an introduction to “the king of wines and the wine of kings,” visiting the historic estate Marchesi di Barolo where the French-born Marchesa Guilia Colbert created Barolo in the 1800s. Today our bike ride in the Langhe, the hills south of the Tanaro River, takes us through some of the most spectacular landscapes of Piedmont. This is the heart of Barolo wine country, so today we’ll pass through the wine towns of Serralunga, Monforte, Barolo, La Morra, and Verduno—all commune names that make a Barolo lover’s heart throb. DAY 8 – BUON VIAGGIO! With its long, rolling hills and charming hill-towns every few miles, Piedmont is a biker’s idea of heaven. The country roads are nicely paved and without much traffic, and drivers are very respectful of bikers (having all biked themselves; it’s Italy’s main sport after soccer). The bike routes on Pedal Piedmont are around 50 km/35 miles per day, but since this is a customizable itinerary, we can add or subtract miles (as well as other activities, such as winery visits or cooking lessons). Keep in mind that these are hilly miles, so 35 miles might seem longer in the saddle than on the page—or on your club rides, if you live on the flatlands. Though there are places where the climbs continue for several miles, the hills are nicely graded, so the climbs are long rather than steep. Patience, stamina, and a granny gear will do the trick. That said, this is not the place to begin a biking hobby. If you’re not already a biker, we suggest our walking tours as a better alternative for an active vacation. Milan’s Malpensa or Linate. Both have convenient airport shuttle buses to Milan’s central train station, the Stazione Centrale (50 minutes from Malpensa, 30 minutes from Linate). Plan to land in Italy a day before the tour begins; that's necessary to be at our starting point on time. Most people spend the preceding night in Milan, though one can head straight to Tortona. For hotel suggestions, email us or consult a good hotel search engine, such as TripAdvisor or Venere. We recommend staying either near the main train station, called the Stazione Centrale (more convenient for catching the train on Day 1), or in the historic center near the Duomo (more convenient for pre-tour sightseeing). From one area to the other, it's about a 45-minute walk, a few stops on the subway, or a 15-minute taxi ride. Our meeting point is the train station in Tortona, a small town on the rail line from Milan to Genoa. Assuming you spend the previous night in Milan, you'll go to Milan's Stazione Centrale and take the 9 a.m. commuter train to Tortona. (We'll provide precise train details in your information packet.) It takes less than an hour, and we'll meet you at the Tortona station. Please let us know if you're coming from elsewhere or spending the previous night in Tortona. From Tortona, we shuttle to Alba (about 1 hour), where the tour gets underway. On our final day, you can depart from Sestri Levante whenever you wish. Depending on time, either we or the hotel can offer you a shuttle to the train station. The train from Sestri to Milan takes between 2hr44min and 3hr20min. Two popular destinations that are within easy reach of Piedmont are the Lake country and the Italian Riviera, including the Cinque Terre. Because Malpensa airport is about halfway between the city of Milan and Lake Como, a pre-tour stay in Como and/or along Lake Maggiore is quite do-able. Post-tour, one could continue south from Gavi to Genoa (only 30 minutes by express train). A working port city, Genoa is the birthplace of Christopher Colombus and offers a world-class aquarium, waterfront promenade (designed by architect Renzo Piano, a local son), wonderful art museums houses in 18th palaces, and a fascinating medieval section. Continue further down the coast, and you'll reach Portofino and the Cinque Terre. Both offer hiking trails and boat excursions, while the Cinque Terre also has scuba diving and public beaches. When packing, check www.weather.com. Go to "Asti, Italy" to get a general idea of temperatures and forecast. In early September, it’ll still be summertime. Daytime temps average 70–75º and nighttime 60º. Price based on the accompanying 7-day itinerary for 4 pax, double occupancy; discounts for larger groups. Modifications are possible, including length of tour, daily mileage, level of accommodations, amount of wine tastings, and inclusion of meals.